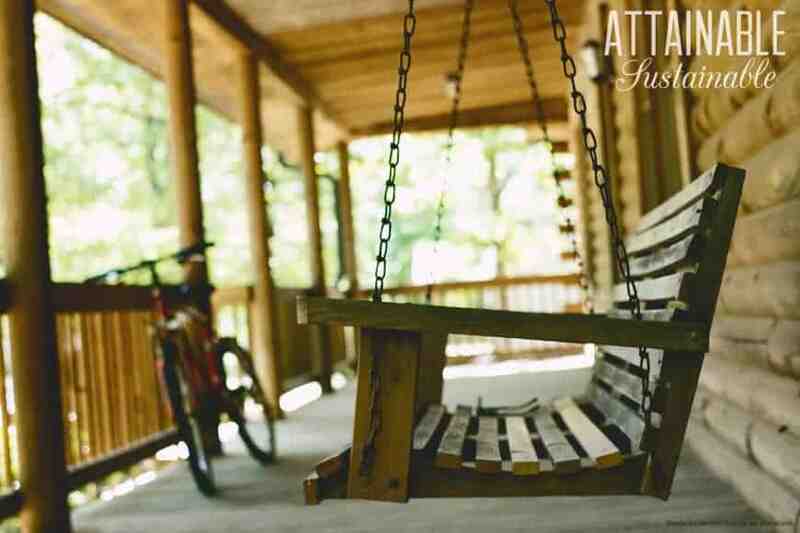 There are so many reasons that we’ve embraced our off grid homestead. Living off the grid has many perks; here’s why we love it and how we do it without breaking the bank. Sometimes we can look out at the state of things and crumble under great despair. The state of our environment, the rampant consumerism, the continual plugging in. Even our children are plugged into technologies and systems that seem to rob us of our humanity. And then the cycle continues. But I also look around and see a reason for great hope. It seems to me that we have spent the last hundred years in these western nations building up industrialism until it has begun consuming us in return. And it seems we are beginning to see a turning point, if still very small. The more I talk to people – and really talk about some of the harder realities of the current age – the more we are beginning to see that change is needed. It is a small minority, to be sure, but it is a glimmer of hope in the darkness. And many seem to realize the solution starts at home, with the individual or the family, and a move back to our now lost connection to the land. An off grid homestead without debt? The truth is that we often have time or money; very rarely both. I can relate because we didn’t have a lot of money when we were convinced to start living off the grid; we certainly did not want to just go into debt. So we saved up enough to buy a couple of acres and get started on bare land. It’s been nearly seven years of building incrementally, adding a cabin, fencing, expanded gardens, a root cellar, and a barn as we made the money to invest in infrastructure. We have a really long list of things that still need doing, but somehow, over these seven years, rainwater catchment, solar, a 700 ft. cabin, outbuildings, fencing, animals, gardens, and fruit trees have all made their way onto the bare five acres that we now call our homestead. 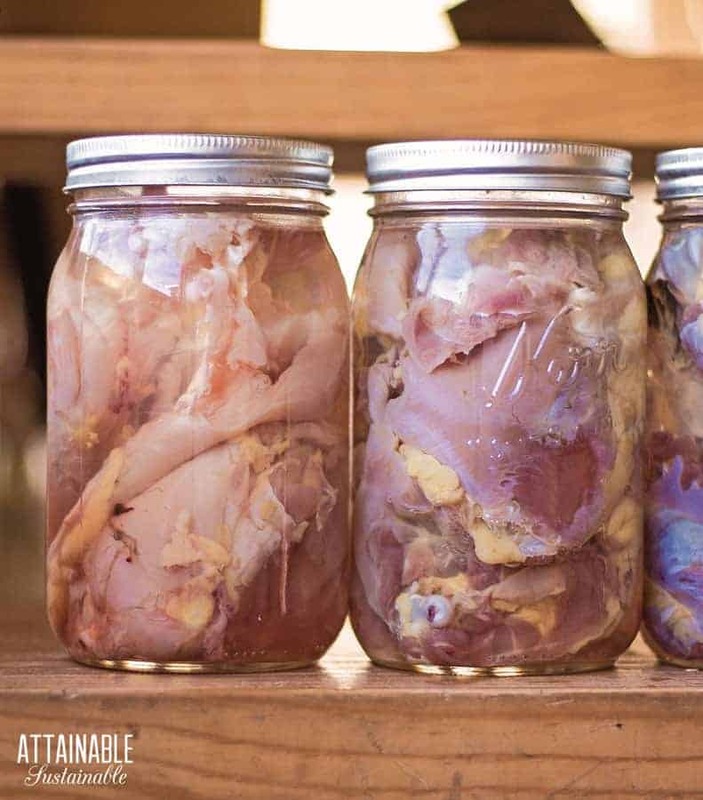 Living off the grid can look a plethora of different ways; there is no one way to skin a cat as the saying goes. For us in our warm Texas climate with plenty of sun and mild winters, it probably looks a lot different than in the heart of the Midwest. Still, many of these setups overlap no matter what region you happen to live in. 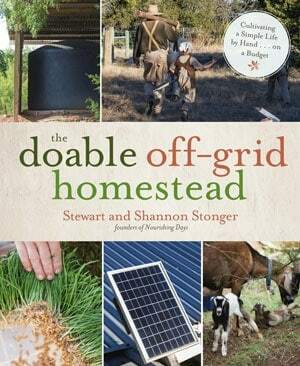 So here are some of the foundations of our working off-grid homestead along with simple, cheap solutions you can implement from our new book The Doable Off-Grid Homestead. 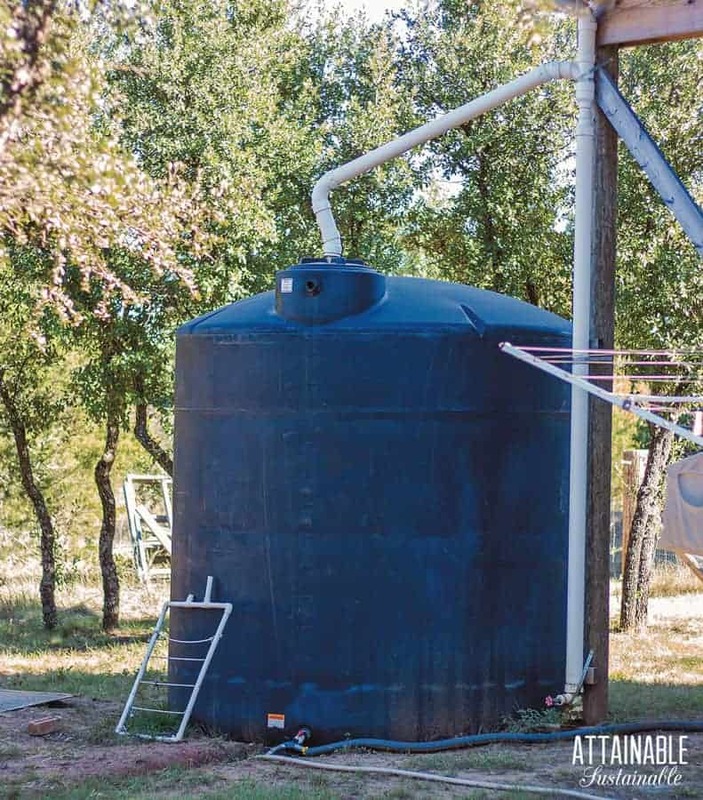 We exclusively utilize rainwater on our off grid homestead for everything from animals to plants to laundry and drinking. Catching rainwater is as simple as having a surface with gutters attached that filter into a tank. But from there you need to move and filter water for various uses. Watch how we made a no batteries required solar water pump. The sun is an incredible resource and can and should be harnessed especially by those of us in sun-filled climates. Over the years solar equipment has become more and more affordable as the technology advances and becomes more mainstream. 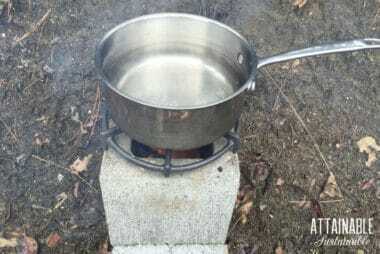 We utilize it for everything from a small refrigerator to running laptops and the internet in order to work from home to pumping water around our off grid homestead. It took us some time to make things work and as we’ve had the resources, we’ve continued to grow our solar setup. Many go big on solar in an attempt to replace all of their modern lifestyle conveniences with solar-powered versions. We took a sort of reverse approach, starting with what we could afford and working up to a longer-term solution. For instance, this is how we converted a 12-V fan to run on solar. A large part of the dream is usually to grow as much of your own food as possible. For us this has been a long and ongoing process. Building soil and planting perennials is the work of a lifetime, to be sure, and we have had many bumps in the road along the way. 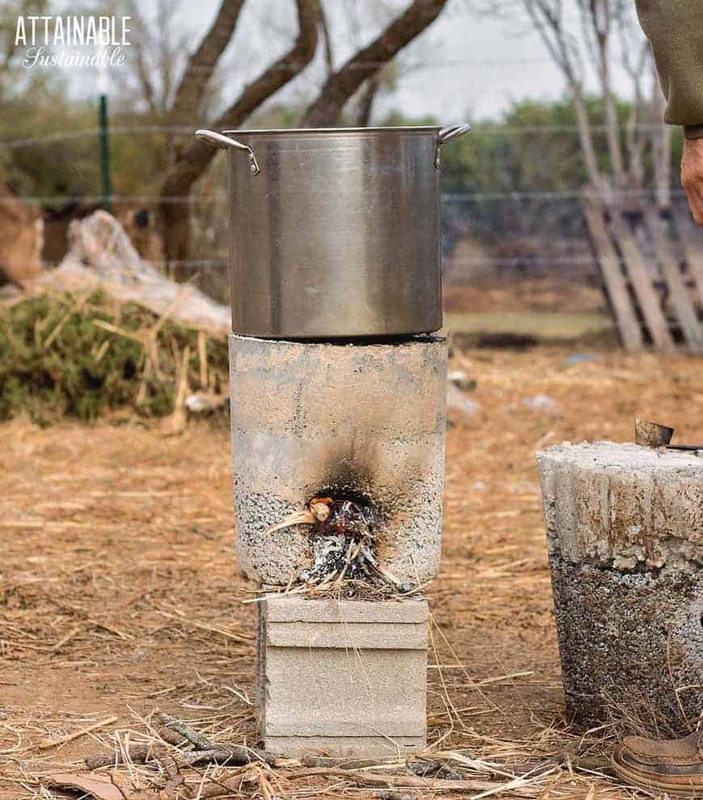 We have certainly brought in whatever outside amendments we could afford to but for financial and sustainability reasons, it was really important to us that we begin to close the loop on inputs to our little homestead. We are certainly not all of the way there yet but we have found that utilizing the natural habits and manure of animals to build better soil is both free and smart. Chickens naturally break up compost piles. Goats clear land like nothing else. And manure… well, I could sing its praises all day long. One of the most important things I have learned is that you really have to work at the soil year after year for your garden to produce. The other is that perennials should be your highest priority when it comes to what to plant right away, what to spend your time and money on, and what to prioritize as you head into a drought. And we’ve begun growing crops that double as food and medicine, such as black Spanish radish. Here’s how to grow them at your place. Whether you just want to raise enough eggs for breakfast or want to layer in dairy and meat production into your small off grid homestead, keeping animals is a real game-changer in terms of sustainability. For one, factory-farmed animal products are inarguably one of the worst detractors to the health of the animals, the people who consume them, and the environment. For another, it is very difficult to find truly sustainably raised animal products unless you luck out with a local farmer you know you truly can trust. The problem we, and many homesteaders I imagine, face is the quality and cost of the feed. Unless you own a substantial amount of land with lush pastures, plenty of browsing room, hayfields and maybe even a crop or two dedicated to animal feed, you will most likely have to bring in feed or hay of some sort. Animal feed that is organic or at least non-gmo is hard to find in remote areas where many of us homestead. It’s also crazy expensive. 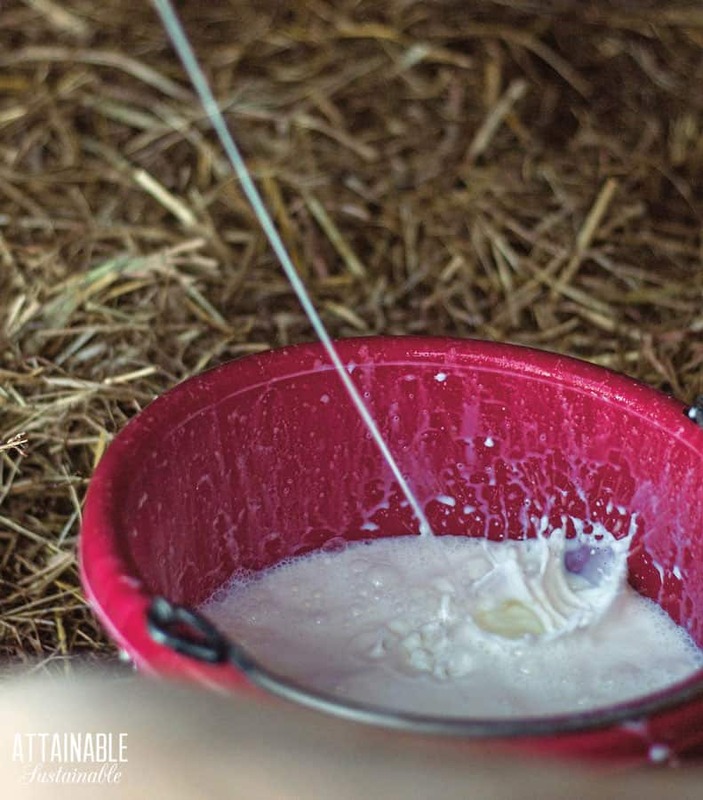 So we have gone outside of the box in the ways that we choose to feed our laying hens, milk goats, and dairy cow. We source local, non-gmo grain as part of the ration for all of our animals which we then soak or ferment for maximum nutrition. We have a DIY fodder system on our off grid homestead and have built milking stands and hay-feeders out of free upcycled pallets. Some of the simplest things to start with are human waste and bathing. We eventually landed on a homemade composting toilet setup and a gravity-fed shower system that works really well for us. 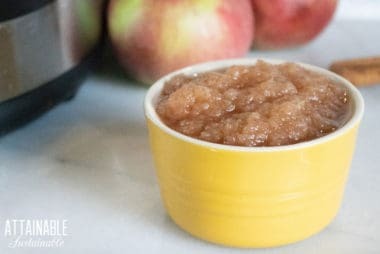 Other things like food preservation, cooking, heating, and the big laundry question had to be addressed in a cost-effective, sustainable way for a large family. One of the premises behind our book is that if we can do it, anybody can. We are still very much an early work in progress when it comes to living off the grid, but taking small steps, one after another, is the only way to begin. 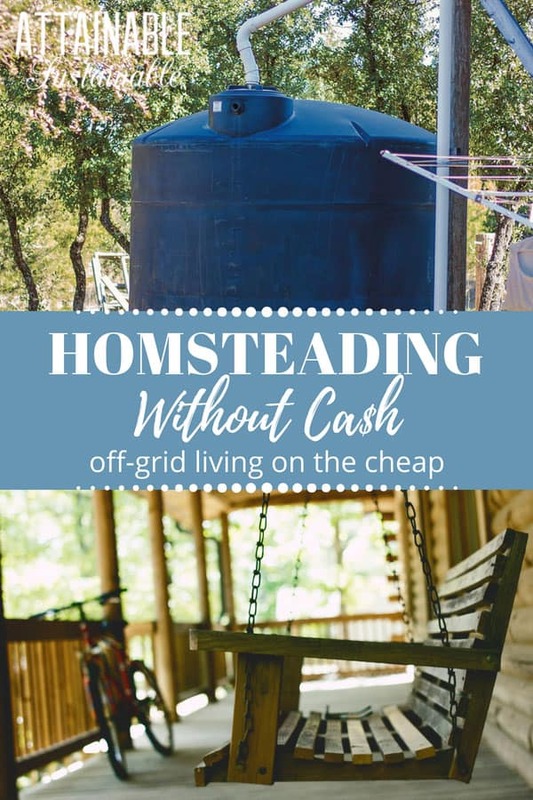 You truly do not have to go into debt or have a large bank account to move towards a more sustainable, and even off-grid homestead. I am dreaming about returning back home! Living the simple life of my grandpa!